When we left off the Complaints HQ garage was full to the brim with metal in the form of one E92 M3 DCT, a shiny new Land Rover Ranger Rover Evoque, and the humble yet feisty Mini Countryman All4. I am happy to say that the Mini is still holding strong! Of course it’s worth noting that this is my wife’s car and she’d almost certainly choose it over me, but I digress. As it turns out, with no powerful force to protect them, the Evoque and M3 did not fare nearly as well. So what happened? What exactly was the deficiency? First let me state that both vehicles are fantastic and should thoroughly satisfy any sane person who is looking for a superlative experience in each of their respective categories. Of course the key words here are “sane” and “respective categories”. Any true performance enthusiast who lives in a region blessed with snowy winters, and has a legitimate need for some level of practicality, can almost certainly identify with this struggle. By all rights 90% of the time all you can truly justify owning is the crossover vehicle that get’s the best MPG. After all you can park them anywhere, they can typically slog through any pre-apocalyptic driving conditions with all-seasons, and they’re less than completely horrible to drive. That other 10% though… Therein that 10% lies the rub. For the true performance enthusiast, even the mightiest crossovers (SRT8, X5M, Cayenne Turbo) can’t truly scratch the itch. Even if they fully talk the talk (go really fast), they can never really walk the walk (look really good and feel agile). The Evoque is an absolutely wonderful crossover. It actually gives up some practicality in the form of rearward visibility and backseat headroom, in exchange for a stylish look. The interior is lovely and it looks probably as good as a small truck can possibly look. In addition, it’s not too bad to drive and can move as well as any normal car (0-60 in 6.7s or so). It has decent cargo capacity, comfortable room for 4 and wears that oh-so-important Range Rover badge. The E92 M3, on the other hand, is an incredible performance tool. The DCT shifts orders of magnitude faster than I ever will, the V8 soundtrack is like a symphony, and the car is quicker than probably 95% cars on the road (60 will come in less than 5 seconds in a typical street start scenario). In terms of balance, feedback, precision and driver experience it finds it’s better only in the 911 and NSX of the cars I’ve owned. On top of all of this it looks sharp, is a bit of a sleeper since most write it off as a basic 3 series, and it is reasonably practical. Until November, that is, when the powder falls and the local news gal starts screaming “SNOWPOCALYPSE!” Now look. I acknowledge that I am incredibly lazy and have bad luck. “Swapping tires” has just never worked for me and never will. With my luck inevitably I end up in a freak early snowfall sliding along on summers through October powder, or I wind up glued to the ground in Blizzaks due to an unprecedented February heat wave. As a result I always run all seasons. Yes, this neuters these fine cars. I get it. In any event, a powerful real wheel drive car is never fun in snow. Workable? Maybe. Fun? No. So I found myself with one car that was extremely fun and semi-practical, which I couldn’t rely on year round. And another car that was quite practical, and semi-fun, which I honestly didn’t want to drive year round. Added to that was the time and effort required to maintain two vehicles. It took less than a year for this to wear thin. I was determined to find the holy grail! A single vehicle that could be both “practical enough” and driven year round, yet was both “special” and not only scratched, but clawed that performance itch! Now to be sure I’d actually already owned some fine specimens here. In particular, I found myself thinking back to Godzilla and, specifically, why the hell did I sell it? Putting on the official hat of introspection, most of my objections to the GTR were very personal and somewhat psychological. It’s a peculiar quirk of mine that used performance cars just never quite sit well with me. Sure if they pass a PPI and all is well you get an amazing deal, dodging initial depreciation but still rolling in style. But if it’s not factory new I never quite form that emotional bond with it. This quirk was eating at me with the M3 as well, but with the GTR it was magnified. The GTR is such a special and exotic vehicle that not having bought it new left me feeling a bit of a pretender. Ridiculous to some I know, but I’ve already admitted I need counseling! In addition driving the GTR is like driving a parade float with a naked supermodel on top waving at the crowd. Some love this. Some need this. I hate this. But with the decision made to evict both the Evoque and the M3, the I’d be lying if I said the GTR didn’t come right back on my radar. Not another pre-owned though. No sir. Brand spanking new! After all, the DBA (12+) car might as well be called a GTR 1.5 compared to the CBA car (09-11). The differences are tremendous. In addition, Nissan had introduced the Black Edition so there was a real opportunity here to get back into a GTR and not feel like I was going backwards. A new GTR BE would truly be a whole different beast than my 09 Premium. So is this a “back to GTR” entry? SPOILER ALERT, but no. Well why not? In a nutshell, Nissan has just gone nuts with the MSRP of the mighty Godzilla. Still a bargain perhaps, but well out of my price range with a 2014 MSRP in excess of a hundred grand. Too rich for my blood! An interesting side note is that now (meaning as of this publication) they can be, since there are not only ’14’s, but still brand new untitled ’13’s languishing on lots. Nissan cannot move these cars and so has ponied up some very deep incentives. As a result there may actually be a “Part II” coming to this entry, but no promises! Full disclosure, I had test driven an S4 and an S5 back in 2012 and come away pretty underwhelmed. 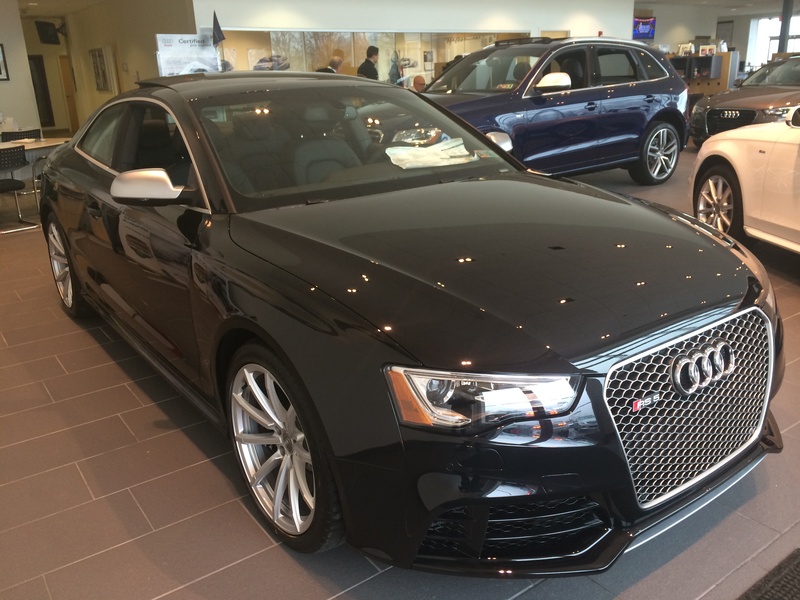 I found that the S5 felt surprisingly slow on the street and the steering felt quite artificial. The S4 was a bit bland. I filled the salesman in on all of this in true “hostile consumer” form (it was his lucky day! ), but he was adamant that this car was nothing like those and encouraged a test drive. Well. Who am I to turn down a test drive in an RS right? Man. After a quick 15 minute run I had to painfully admit that the guy had a point! So how is the RS5? And most importantly… Door close = solid THUD. THIS is key! This is all well and good, but what about what matters? What about performance? From the first press of the accelerator I knew that this car had nothing to do with the S4 or S5. It felt fast. “WTF are those magazines talking about?” fast. Anyone who has read any review done by anyone other than Motortrend (whose reviews seem to directly mirror my own experience) needs to drive this car for themselves before judging it. The RS5 is a monster on the street. Quattro is more brilliant than ever and just grips. The engine is a beauty. Much like the E92 M3 it is a high revving small block V8 (4.2L in this case making 450HP). Forget the masses who fixate on torque numbers and lack the ability to rev an engine. Both the E92 M3 and the RS5 provide an exotic experience in the form of 8000+RPM on a screaming 8 cylinder For those who are able to actually articulate their ankle, the numbers prove that both fly despite torque figures (295 for the BMW and 315 for the RS5). Power to weight on these cars is about the same, but the Audi feels quicker. And this feeling extends far beyond 60. At the top end, say from 70-110 (in theory… not that I’ve ever tested this! ahem) the RS5 can feel GTR quick (I’m sure it’s not, but it feels it). Perhaps more importantly, the aural feedback that comes along with all of this performance bests any car I’ve owned short of the Tubi equipped NSX. That includes the 911 with PSE. Full disclosure my car has the factory sport exhaust, but I can say with confidence it is the best exotic V8 soundtrack this side of a Maserati. I cannot say enough about the Audi dual clutch. The DCT was great, the Audi S-tronic is beyond great. It’s the smoothest dual clutch I’ve ever driven (in a different universe than the GTR) and feels almost like an automatic, yet when you engage “dynamic” and whale on it, it is just as neck snappingly quick as the GTR or M3 DCT. An aggressive blip of the throttle greets every downshift and upshifts are instantaneous. The sport mode is smarter too. Whereas on the M3 you have a giant range of settings, and the most extreme trans setting (S5) is honestly a bit too brutal to use for daily driving, the Audi provides only 3 settings (auto, soft and uber) and more intelligence. The Audi dynamic mode is every bit as aggressive as DCT S5, but is also smarter about how long to hold revs before upshifting and when to downshift based on dynamic conditions. With DCT I only used S5 when testing and most of the time left the car in S3. With the Audi I leave the transmission in “sport” about 30% of the time. Engine: a wash… very similar engines. Both phenomenal, high reving, V8s that are certainly extinct in this era of forced induction on every car soon to be replaced with electric power plants. Comfort: a wash… both cars are extremely comfortable. Shockingly so for near sports cars. The US RS5 lacks dynamic ride control, but I found the factory coil over setup on 19’s (the standard wheels) provides a much nicer, yet also more confident, ride than my M3 did. My M3 had EDC, but was also rolling on the optional 20’s. I found no EDC setting was quite right. Sport was excellent in terms of handling, but too jarring for the street. Comfort was better, but introduced body roll which I didn’t like. All in all my opinion on ride quality remains solidly anti “big wheels”. My rule of thumb is that the rubber to rim ratio should be the greater of all the possible combinations. If the wheel well can support 20’s, I like 19’s. If it can support 19’s, I like 18’s. Very difficult, by my but measurement, to compensate for a lack of rubber with dampening. Steering: a wash… both cars are fantastic. Caveat… My RS5 does not have the electrically assisted dynamic steering. EPS is the devil and I hate it. M3 steering is possibly just a hair more direct. Soundtrack: RS5 – the exhaust note and engine sound of the RS5 has almost no equal among sport coupes. 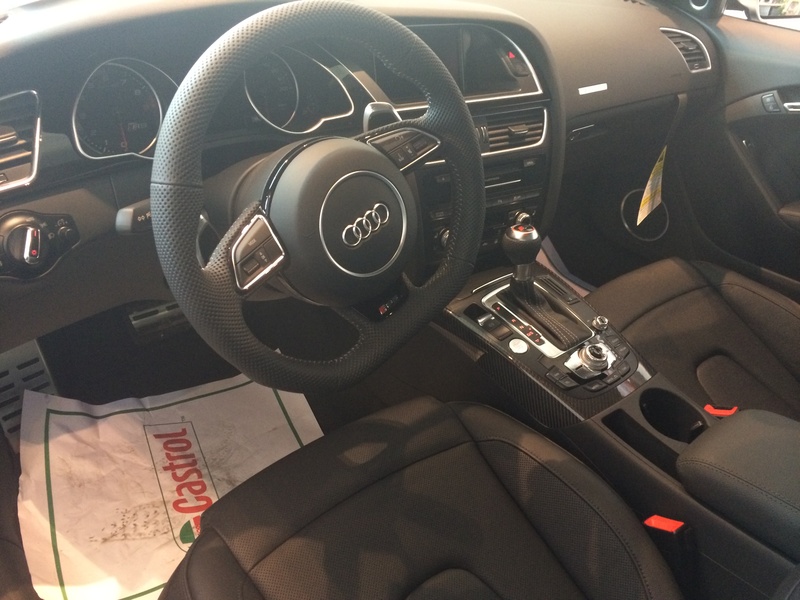 Practicality: RS5 – interior room is about the same. Trunk space is about the same. The RS5 is a tad larger and heavier of a car, but close enough to keep them in the same class. But the RS5 has Quattro. And Quattro is a thing of genius. Quattro eats snow. Fun Factor: TOUGH one… at the limits, in a highly dynamic situation, the M3 brings it all together. The M division roots go deep and the M3 “is racecar”. The RS5, on the other hand, is an Autobahn barnstormer. That’s what it was built to be. It’s a land missile that feels ridiculously fast on the street yet is easy. Despite that, it surprises you often with just how nimble it is and just how far out its limits lie. While it doesn’t provide the near telepathic feedback of the M3, it’s light years behind any lesser automobile and it sounds better than just about everything. Really a tough call here. Did I leave anything out? I don’t know, maybe. But this entry is getting too long and you get the idea. Overall I am extremely pleased with the RS5 even though I’m still only lukewarm on Audi in general. At $77,000 I think it was too expensive, but that’s how things are going these days and, next to the $100k+ GTR, it actually feels like a bargain. Yes Godzilla brings insane performance, but as an actual car that you use to drive somewhere other than Cars and Coffee you leave a lot on the table and it is now 911 money. Compared to the M3 I’d say these are very very close competitors, but the one place the M3 simply cannot compete is all-weather utility and for that alone, the RS5 is the winner! Now let’s see how it lasts! The Lab Goes SDN: Part 4 – Finally a Real (Virtual) Router!